Come to our Open House – Then Make It Yours! Turn into Highlands at Heritage Hill and turn left at the first three-way stop and follow this road all the way until you see this beautiful white farmhouse on your right with the Justin Doyle Homes "For Sale" sign in the front lawn. 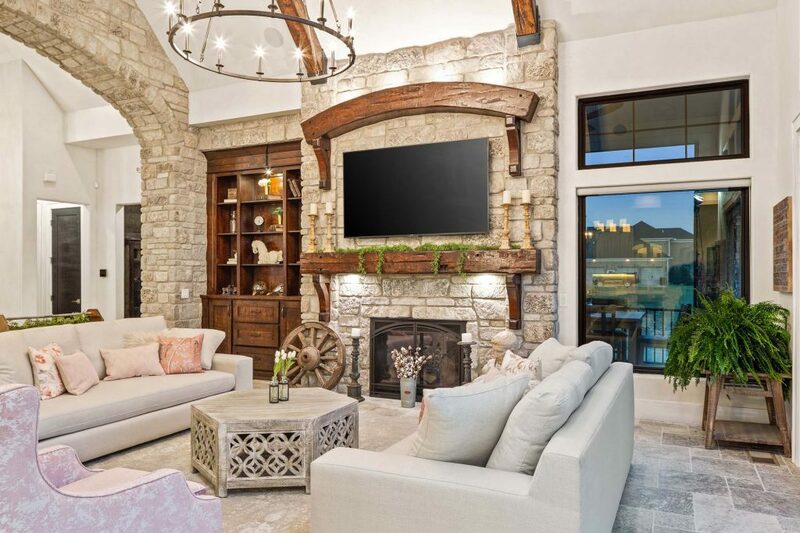 This luxurious urban farmhouse is an entertainer's dream indoors and out. The lower-level boasts a sunken home theater, wine cellar, bar area and extensive space for guests. The main level of the home has an open floor plan centered around cathedral ceilings within the great room and covered terrace and true chef's kitchen. This home is the perfect blend of cozy and luxury and features clean lines and bold finishes throughout. Get a personal tour before someone else makes "The Savannah" their dream home, or keep scrolling to learn more and find out how you can see "The Savannah" at Homearama Cincinnati 2018! 1st floor: 3,480 sq. ft.
Lower Level: 2,695 sq. ft.
Total Square Footage: 6,175 sq. ft.
Last year's Justin Doyle Homes Homearama House was sold before Homearama even started! Make "The Savannah" your dream home before someone else does! Or – see "The Savannah" at Homearama '18! The Cincinnati Homearama showcases single-site new homes by the Home Builders Association of Greater Cincinnati. Gather your family and friends, jump in the car, and take a road trip around the area while touring beautiful homes from local homebuilders. Whether you're looking to build or just looking for inspiration, Homearama has something for every lifestyle. Get Directions to "The Savannah"
Click the map at right to expand the site map for this year's Homearama! Note that Justin Doyle Homes will be on both lots 6 and 9. Browse home and business listings for photos, videos and contact information. View homes and businesses on an interactive map and get directions to each home and local business. Get details on HBA members involved in each phase of the home buying process. Access to discounts and coupons from HBA members and local community businesses. Follow and participate in the HOMEARAMA® with the Calendar of Events. Utilize the quick links offered in the side menu to quickly access information about the local community. If you didn't make it out to Homearama, check out this virtual tour or this luxurious urban farmhouse! Give us a little information about you below, and we'll reach out to you to schedule a personal tour of "The Savannah!"